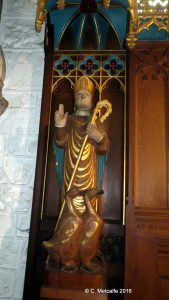 St Swithun’s Day is on July 15th. The parish patronal festival is usually held on the nearest Sunday, celebrating the patron saint of St Swithun’s church in East Grinstead. 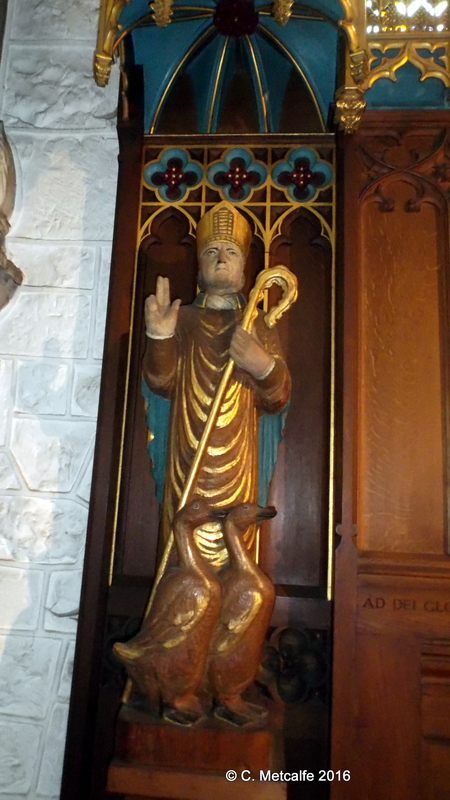 The statue of St Swithun was carved by Miss Elizabeth Dempster. The ducks are a reminder of the rain that often falls on St Swithun’s Day. By tradition, if it rains on St Swithun’s Day, there will be rain for the next 40 days. It is not clear why a church in the diocese of Chichester was dedicated to St Swithun, who is associated with Winchester. Nor is it clear when the dedication was made. It is believed that the church was dedicated first to King Edward the Confessor, when, perhaps, a wooden chapel was hastily built to shelter his body on its way to Westminster Abbey. This is only a story, not backed up by documents. Or, the church may have been dedicated to St Edmund. Edmund lived from 841- 869 AD and was an early Christian king and martyr. He was King of the East Angles. He was killed by the Danes, and in some accounts he was tied to a tree, shot with arrows, and had his head cut off. Afterwards, his tame wolf guarded his head. This gruesome story is partially suggested by another statue showing St Edmund, with a wolf and some arrows. Elizabeth Dempster, who made the statues of Swithun and Edmund, is likely to be the Scottish sculptor Elizabeth Strachan Dempster, who lived from 1909-1987. Most of her recorded work is in Scotland and she became an Associate of the Royal Scottish Academy. The carved oak reredos (back screen) and altar were given in 1928, by the late Rev’d Leslie Norris, in memory of his wife, who died in 1926. Mr Laverty of Winchester was the craftsman.